Next week on November 10th, UNCORKED, a new series about Sommeliers premiers on on the Esquire Network. UNCORKED follows six people in New York as they prepare for the Court of Masters Sommelier exam. The show employs all the standard reality TV techniques and manufactured drama we’ve come to know in the Bachelor and Housewife franchises. Fortunately, UNCORKED is far less tawdry as we follow the individual eddies of triumph and disaster that ebb and flow in each persons back story. The six candidates range from the likable and compentent Jane, to the overly casual Dana. I suspect Dana’s too-cool for school attitude is really just his attempt to cover his introversion and social anxiety. Yannick is the wild-card, the set up is that it’s his last chance/attempt to pass the exam with the added burden that he is in a wheel-chair. Rounding out the group are Josh, Morgan and Jack each with their own personality quirks that emerge under pressure. The best performance is by Geoff Kruth, MS, and President of Guildsomm.com who does his level best to be friendly and supportive to the candidates and soften the oft times harsh criticism of his colleagues. Kruth has an easy manner, a bloakish affability that’s revealed as he offers endless facial expressions of empathy to the harried, stressed out sommeliers when they botch their practice sessions. He’s like a silent and loyal emotional support dog looking after them. Some scenes gave me the feeling that a Master Sommelier candidate’s success is hinged to a secret ballot that allows the guild to approve those they deem worthy of their exclusive ranks, and deny entry to those that may have the skills but perhaps not the right personality in their view. Much of the feedback given by a handful of gatekeepers make it feel more like a Fraternity/Sorority Rush Week or hazing than a professional development path. 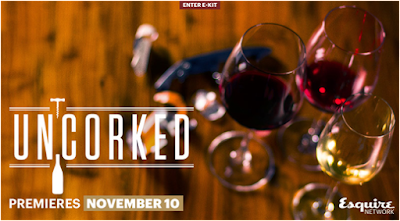 Nonetheless, If you loved SOMM the film, you will probably enjoy UNCORKED too. As with the majority of reality series, the most entertaining parts are provided by the real-time chatter of viewers on twitter. So grab a glass of wine (or a bottle) and tweet your comments as you watch next Tuesday. All my friends are Somms and they drink all day. I love to taste their wine and hear what they have to say. California dreamin' on such a vintners day. Stopped into a wine bar I passed along the way. Well I sat down at a table and saw some bottles on a tray. She hopes I'm gonna pay. California dreamin' on such a vintage day. *California Dreamin’ actual lyrics. Click link for video of actual song. All the leaves are brown and the sky is gray. I've been for a walk on a winter's day. California dreamin' on such a winter's day. Stopped in to a church I passed along the way. Well I got down on my knees and I pretend to pray. He knows I'm gonna stay. I’m currently doing slow lazy circles above my blog like a condor riding a thermal. Is blogging dead?